Well, sorry to not post last week. I was in TN with family. We go there every year and rent a cabin in the smokies. Great time! I learned some awesome new board games (Carcassonne). As usual I scored several new books at some of the discount bookstores down there. It was fun. I'm talking better deals than what you find on Amazon. 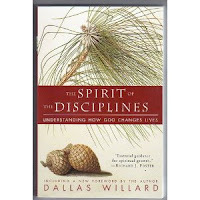 Well, back to Willard's book on how the spiritual disciplines work. Chapter 3 of The Spirit of the Disciplines deals with salvation as a life and not just a point in time. Can you remember when you first received Jesus into your life? As one coming from the Wesleyan tradition I relate well to the idea of salvation as a journey. This is what one of my Profs from IWU would say in almost every class and then ask the class to repeat out loud with him. Thanks for reinforcing that great truth Chris Bounds! More than just the journey, this chapter deals with how faith affects our bodies. What does it mean that we can experience eternal life right now? If you read Acts you will notice that there was a power moving in the Christians in the New Testament that turned them into new creations, helped them rise above sin, and have victory over evil. Are you experiencing that? If not, maybe it’s time you start exploring the spiritual disciplines. This chapter is a precursor to the next 3 chapters that deal with the theological basis for the spiritual disciplines. Had fun with you last week!! :) I heard you're the only one not sick... stay strong!! :) Love ya! !